The steering knuckle provides an attachment point for the tie rod to the wheel. The steering knuckle also provides an attachment point for the upper and lower ball joints in conventional A frame suspension system. With Macpherson strut systems, the steering knuckle anchors the lower end of the strut and the lower ball joint. 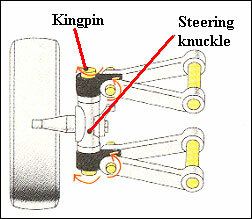 The spindle of a rear wheel drive vehicle is supported and attached by the steering knuckle. With a front wheel drive vehicle, the front hub and bearing assembly is attached to the steering knuckle. Disc brake systems also use the steering knuckle as a mount for the brake caliper. The components attached to the steering knuckle will usually wear out before the steering knuckle itself. In fact, most of the damage to a steering knuckle will occur from collision damage. Control arms, commonly referred to as “A Arms”, provide a flexible attachment point for the suspension components to the frame of a vehicle. Vertical movement of the control arm is allowed through the use of bushings placed in the end of the control arms at the attachment point to the frame. In a conventional front suspension system, the lower control arm is attached to the frame and provides support for the bottom of the coil spring. The upper control arm is attached to the frame and flexes up and down in unison with the lower control arm. The upper and lower control arms are both attached to the steering knuckle by the upper and lower ball joints. Only the lower control arm is used in a vehicle equipped with Macpherson struts. The upper end of the strut provides support for the vehicle suspension and also acts as a swivel for the steering knuckle. The lower control arm attaches to the frame using a bushing to enable it to swing up and down. The lower control arm attaches to the steering knuckle using the ball joint and will flex up and down in unison with the strut. Wear of the control arm is usually confined to worn control arm bushings and can cause a knocking noise to emanate from the front end when braking or accelerating. Wheel alignment can also be affected. 3 Comments on "Steering Knuckle"
I was in car accident. A car hit me from the left side toward the front tire. Leaving tire to go inward. Just got left lower control arm done. Cost me $300. Tech says I need. 2tires, left knuckles, inner tie rod done. So, my 01 Monte Carlo will steer left but will only steer right if turning gently. The moment you start to turn even slightly hard the steering wheel pops and the car keeps going straight. It feels like the steering wheel itself popping to be honest. I don’t care about repair costs…I bought the car knowing what I was getting into. What better opportunity to get more experience working on cars. I just want to know what it could possibly be.